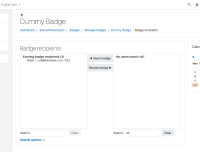 As Admin, in badges/index.php?type=1 create a new badge, having 'Award Badge criteria' set to 'Manual issue by role'. Select the 'Recipients (0)' tab. Click the 'Enable Access' button at the right hand side of the warning 'This badge is currently not available to users. 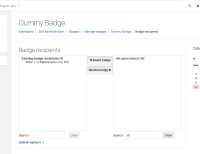 Enable access if you want users to earn this badge.'. Confirm. Click the 'Award badge' button. The buttons "◀ Award badge" and "Revoke badge ▶" are styled like any other button. The buttons "◀ Award badge" and "Revoke badge ▶" are styled otherwise. In Clean theme, the buttons do look okay.